I picked up a Star Wars book after a long time. This is the first book of the Dark Nest Trilogy, set after the completion of The New Jedi Order series. A new species is starting to colonize the Galaxy, near the borders of Chiss space – a species with a collective mind. A collective mind that can influence and absorb the will of some Jedi. As the younger Jedi Knights of the New Jedi Order go and answer the Colony’s call, the elders – Luke, Mara, Han and Leia rush to their side in the interest of preventing war and restoring sanity. Although the book starts off a tad slowly, the plot gets really interesting; and had me totally absorbed. A number of subplots, including one where R2D2 is trying to hide something from Luke make the story really interesting. What I like most about Star Wars books is the ever greater challenges that the authors come up with for the Jedi – and that the solutions to these are always complex and never black and white. Let me stop before I give away the plot. In fact, I’d always like to remember how I read this book – I finished it off by sitting in a coffee shop (Gloria Jean’s at Raffles City Tower) for three and a half hours with a blueberry cheesecake and a cup of coffee. Something I hadn’t done in a long time – sipped caffeine and got myself a sugar high while being totally absorbed in a galaxy far, far away and reminding myself what I often forget – reality is overrated. 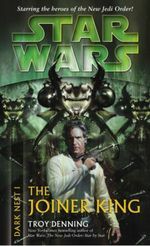 Oh, and Star Wars fans of extended universe fiction can rejoice – although this book is the first in a trilogy, it actually has a reasonably decent ending and a conclusion, though of course there are enough loose threads. Some Star Wars trilogies are notable for ending bang in the middle of a sentence. I’m looking forward to reading the other two books. This was written by Anshul. Posted on Monday, October 15, 2007, at 12:01 am. Filed under books, reviews, star wars. Bookmark the permalink. Follow comments here with the RSS feed. Post a comment or leave a trackback.